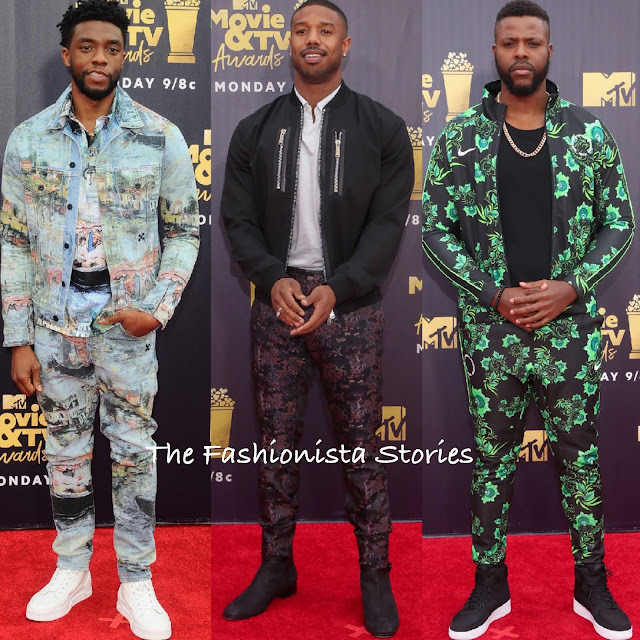 The men made their way to the red carpet yesterday evening(June 16th) for the 2018 MTV Movie & TV Awards yesterday evening(June 16th) at the Barker Hanger in Santa Monica, CA. To see all of the celeb looks, click HERE. Chadwick Boseman who is fresh off of his vacation, rocked a OFF-WHITE RESORT 2019 printed denim jacket with the matching button down shirt & jeans. Some people posted on instagram how they didn't like this but I actually do. However I would swap the matching shirt out for a solid hue. CHRISTIAN LOUBOUTIN white sneakers topped off his look. Michael B Jordan looked great great in a DSQUARED2 black zipper detail, bomber jacket with a white shirt underneath and printed trousers. CHRISTIAN LOUBOUTIN black boots finished up his look. Winston Duke rocked the NIKE 'Nigeria' green & black printed track jacket with the matching track pants. I really love his look, it's a casually cool look and the sneakers ties everything together. A gold necklace and a DAVID YURMAN jewelry ring finished up his look. Nick Jonas wore a SAINT LAURENT black leather moto jacket and printed shirt which he teamed with black denim and black boots. Dan Levy brought his style game rocking an GIORGIO ARMANI printed jacket which was teamed with a white shirt and black crop trousers. The burgundy CHRISTIAN LOUBOUTIN shoes was the perfect accessory to top off his look. Chris Pratt wore a two-piece suit with a navy printed shirt underneath. His look was paired with his favorite FRYE boots.